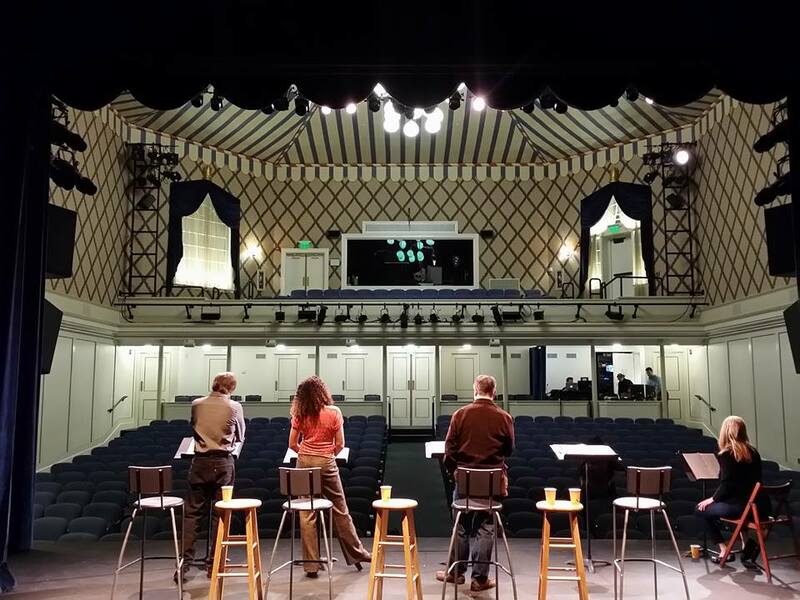 Aimee directed a staged reading of Dominick DeGaetano’s play Turing Test for the John Drew Theater Lab at Guild Hall in Southampton this week. As you can see from this picture looking out into the house, this is an amazing theater. I don’t know what the design was based on, but it was very warm and inviting. Not to drop names but Alec Baldwin has a box in the back (the one in front of me in this pic, I believe) and Alan Alda has one across the aisle. Mr. Alda’s Hawkeye Pierce was one of my inspirations as an actor and as a person. Stand up against injustice and nonsensical authority but keep your sense of humor, even when things are at their worst. The cast of Turing Test checking out the sound before the reading. It was cool to read with Minerva Perez, who is to my left in this picture. We worked on different readings of this and then were thrown together. Well, I was thrown with everyone else actually. I’m of two minds about saying this but Minerva was a child actor in the movie Caddyshack. She played the girl who threw the Baby Ruth in the swimming pool. I didn’t say anything about it and I’m sure she likes to forget about it but that was a real iconic moment from my childhood. She had quite a cold that night so she really deserves the MVP award for the night. I like doing staged readings. There are many kinds. The trick is to make the script disappear. This is best exemplified by the Encores series at City Center. Really, that thing is a full production and they happen to have scripts in their hands. But for the most part the binders magically are invisible. In a situation like this where we sit on the stools when we’re “off” and go to the music stands when we’re “on,” there can be a little pressure to keep things interesting. You don’t have staging to help clarify and tell the story. I tend to work my music stand a lot. I pull it up and down. Use it as a podium. Aim it at other characters. Turn it into a bar and lean on it. Drum my fingers. Slap my script on it. So, I need to make sure it is pretty sturdy but also adjustable. The one in the picture was perfect for this. I’ll put one foot on one of the three feet pointed at me while the other two face the audience so it won’t fall over on the person in the front row. I get very antsy before most readings. The best thing for me is to go for an hour or two-hour walk before it starts and think through the whole thing. It’s not memorized but I don’t want the audience to feel like I’m catching up to myself the whole time. I’ve seen those. They aren’t pretty. I also don’t like the feeling of only sketching where the character is emotionally. It’s like running alongside of a motorcycle, instead of being the motorcycle. In this situation, I have to keep reminding myself to keep up or get left behind. If you dwell on something that didn’t work, you run the risk of losing the next moment and the next moment. Overall, I think this went over very well.